Fly Fox Productions: Mistborn: The Hero of Ages. Reviewed. 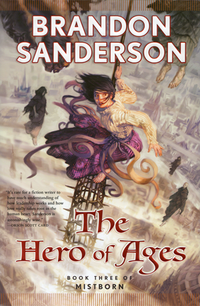 Mistborn: The Hero of Ages. Reviewed. I finished the last book in the Mistborn trilogy a month ago. I have not written a review yet for two reasons: 1. I wanted time to think about the trilogy as a whole and how I could best represent the third book and the trilogy overall. 2. I am incredibly lazy. The Hero of Ages grows naturally out of the first two books in the trilogy. Unlike so many book series especially in SF/F genres each book in the trilogy stands on their own but also continues the plotlines of the overall story. In the first two books we saw the characters grow into warriors and rulers, in the third book these two things come to a close as the characters try to stop the destruction of the world. Overall this was a satisfying ending to a good trilogy, but I must be honest and so I must say that as the series progressed my love of the trilogy waned. After the third book I was left with conflicted emotions about the trilogy, I wasn’t sure if I thought it was great or just okay. I’m not sure why I couldn’t come to a decision, the characters were the same, the plot was different and engaging and yet it felt odd. At the end of the book Vin and Elend Venture die in battle and Sazed becomes the hero of ages and remakes the world to save it from destruction. The rest of the characters remain to rebuild civilization in this newly reformed planet. This ending ties the loose ends up in a nice neat little bow, and that may just be what I don’t like. The first book was brilliant. It contained a complete story that left you wanting more. The second book molded the characters into rulers and lawmakers. It made you believe that a new world was possible if evil could be defeated. The third book obliterated evil and remade the world, but it also destroyed all the efforts that were put forth in the second book. The third book made the second one a little superfluous and the ending of the third book made much of its own story superfluous as well. What was the point of finding out about how Elend’s government worked only to see it destroyed? I don’t want to seem overly critical so I will say that I feel this trilogy is at its core about myth, Kelsier became mythical in the first book inspiring those around under oppression to rebel against their oppressors, Vin defied the mythical lord ruler and overthrew a dictatorial government. In the second book ancient myths were explored as well as their change over time and literary evolution. In the third book the characters themselves became myth by establishing a world where a people could live and grow. This new mythology of the Mistborn world creates a fictional landscape that I am looking forward to exploring. I may have been disappointed in the path but who can complain if that path leads to an airport with flights leaving for beautiful and exciting places? I like this series. I recommend this series.